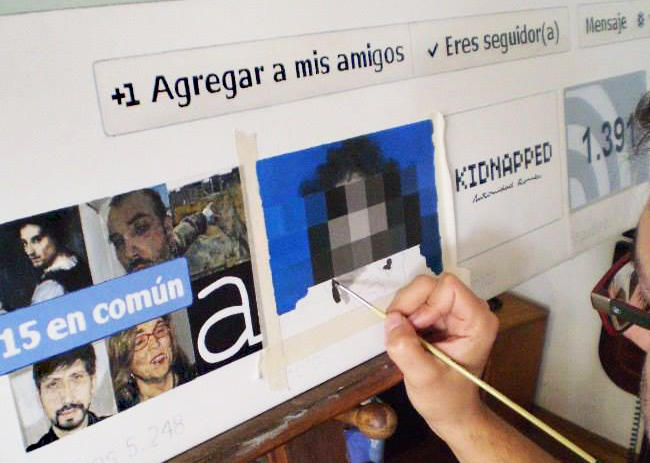 El retrato de Intimidad (A Portrait of Intimacy) The relationship between Rivas San Martin (Santiago de Chile) and Intimidad Romero (Barcelona, Spain), began in 2012 and continued through the exchange of private message on Facebook, ultimately inspiring the creation of this painting. “Intimidad Romero’s creative process consists in digitally modifying photographs from his daily and intimate life, pixellating a specific area of the image – that little bit that could reveal his true identity – and by means of this gesture marking ordinary photos with the signs of censure and distance, even as they retain those of intimacy and familiarity, in such a way that the public and the private meld into a single signifier.” (Tecnogger.co). 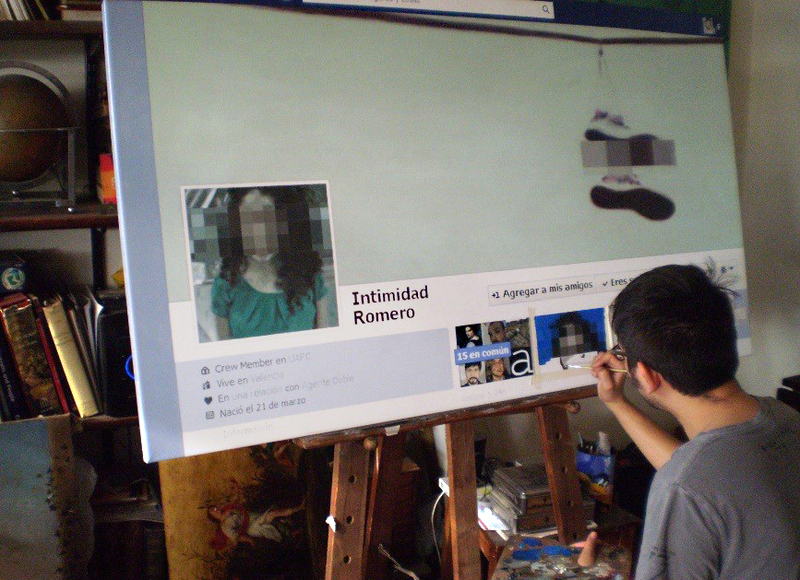 Without having absolute certainty about who Intimidad Romero is (or are), and without having seen his (or their) face(s), Rivas decided to produce this “portrait” consisting in the transfer to painting of a screenshot of the virtual interface of Intimidad Romero’s Facebook page. Felipe Rivas San Martín (Valdivia, Chile, 1982). Visual artist, writer, and activist of Sexual Dissidence. Bachelor’s Degree in Visual Arts from the Universidad de Chile. Currently enrolled in the Master’s Program in Visual Arts at the same university, as a recipient of a scholarship from the National Commission for Scientific and Technological Research (CONICYT). 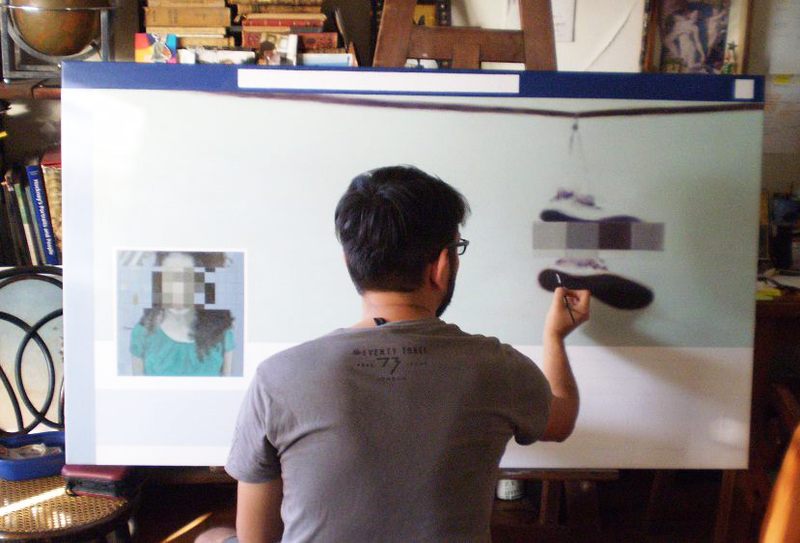 Develops an in-disciplined production related to painting, drawing, performance, and video by way of the technologically-mediated image (virtual interfaces, QR codes, etc.). His work centers on the transfer and displacement of formats, the production of contemporary subjectivities, and the relationship between the body, the virtual image, and new modes and means of communication. He has participated in art shows in Chile, Argentina, Spain, Germany, the United States, Peru, Colombia, Mexico, Switzerland, and France. He was one of four Chilean artists selected to participate in ARCOmadrid 2015, where he mounted a solo exhibition as part of the selection Solo Project.